Beans are the most used ingredient when it comes to salads. As they make a great taste in combination with other ingredients, they’re liked by all age groups. Similar is the case with the Baja Bean Salad, in which usually, kidney beans are used, which takes this dish to another level. Although this is a simple salad, but the combination of various ingredients with Kidney beans makes it an extremely appetizing dish. Baja Bean Salad is basically inspired from the Mexican flavours, and just like other Mexican salads, it gives a fresh feel and is terrific in its own way. The preparation method of the salad is not too complicated therefore you can easily make this salad in about 10 minutes or so, if all the ingredients are available. Those, who love to eat and make various salads, will definitely enjoy this one too. 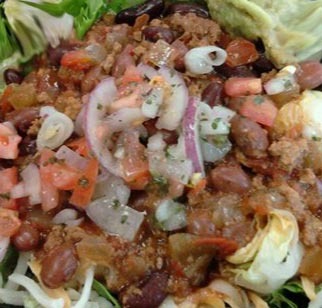 You can try out this amazing Baja Bean Salad by following the simple recipe below. Take a large bowl, place kidney beans, tomatoes, chickpeas, onion and cucumber in it in order to combine all these ingredients. Now, take a small bowl to mix guacamole, salt and yogurt together. After mixing these ingredients, if you found their dressing thick then, stir some milk in it. Stir in the large bowl or bean mixture and then, allow it to chill. Before serving this salad garnish it with tortilla chips and lettuce.